The pineapple-on-a-pizza flavor or Hawaiian pizza was first created in 1962 by Sam Panopoulous at the Satellite Restaurant in Toronto, Canada. From then, it became a popular pizza topping and also a target of dislike for others. 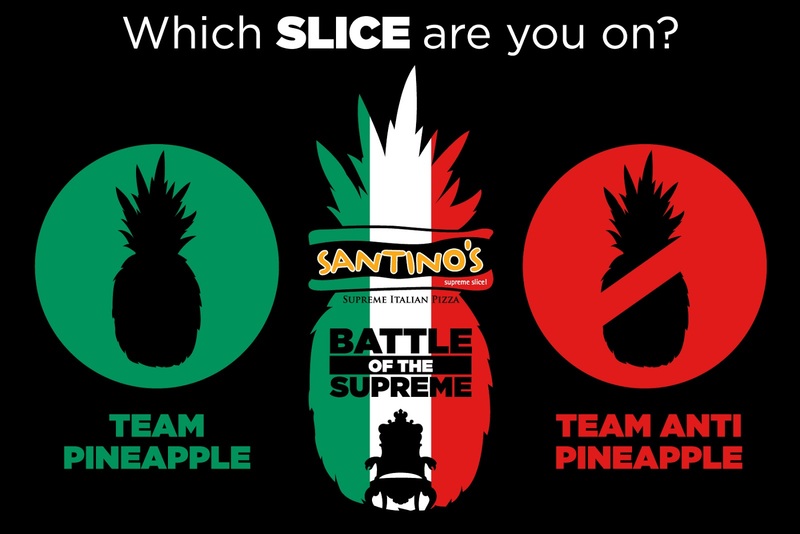 As the debate continues worldwide, Santino's Supreme Slice has created a platform to a friendly yet interesting competitive debate for all pizza lovers on its very first BATTLE OF THE SUPREME: Team Pineapple vs. Team Anti-Pineapple Campaign. This is a series of dare battle videos between two teams that will be uploaded on the official Facebook page of Santino's Supreme Slice. The battle started last February 14. Each representative of the team must accomplish the dare to score a point and the team with the highest total points will emerge as the winner..
Supreme pizza lovers out there can show their support by buying Santino's Supreme Slice Hawaiian Madness for Team Pineapple and Santino's Supreme Slice Non-Pineapple Flavors for Team Anti-Pineapple. Santino's Supreme Slice now has over 200 SUPREME outlets nationwide.